Even when you’re in a city surrounded by water, the movement of tides can become invisible. 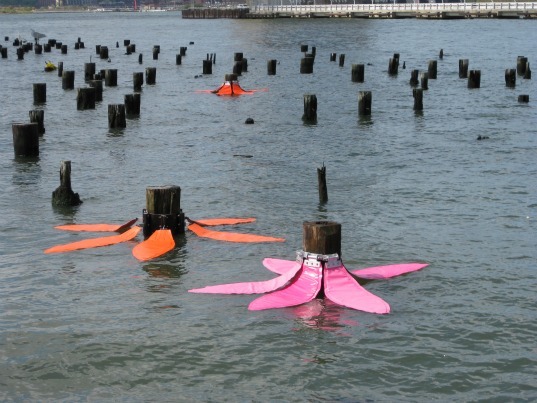 Artist Stacy Levy took the fluctuation of tides and amplified them with a series of giant Tide Flowers. Created to “bloom” around abandoned posts of long-gone piers, these blossoms wilt at low tide and open fully at high tide, creating a whimsical commentary on a very powerful — and imminent — natural force. “I try to design a project so that the site tells the ecological story of itself,” writes Levy in her artists’ statement — words that ring very true of this piece. With all the talk of Sea Level Rise and foreboding maps of cities submerged in fields of blue, it’s hard not to regard the regular movement of the tide as foreshadowing of flooding to come. Tide Flowers acknowledges the tides with humor and color, while still making very clear what their slow rise means. 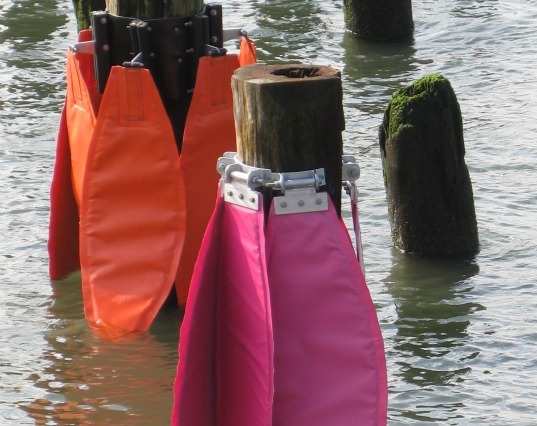 Commissioned by the Hudson River Park Trust, the piece was installed around piers 25 and 26 in New York City. It included a total of 33 “flowers” with six petals each. A video of the installation reveals that a certain amount of swimming was involved in getting the petals in place — a whole other level of interaction with tides. Even when you're in a city surrounded by water, the movement of tides can become invisible. Artist Stacy Levy took the fluctuation of tides and amplified them with a series of giant Tide Flowers. Created to "bloom" around abandoned posts of long-gone piers, these blossoms wilt at low tide and open fully at high tide, creating a whimsical commentary on a very powerful -- and imminent -- natural force.